We have a fun giveaway to share with you! 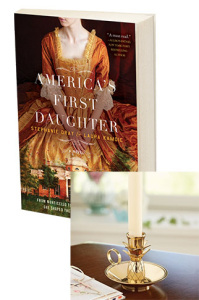 Three people will win copies of America’s First Daughter and candlesticks from Monticello in this giveaway here (U.S. per the publisher)! Also hop over to Laura’s Facebook page for a chance to win gift cards for sharing a post about the book/candlestick giveaway! Good luck everyone! ← Watch Us on Virginia This Morning on CBS6! I was so excited to discover this book. I am a fan of Thomas Jefferson and cannot wait to add this book to my library! I also love books concerning women’s history and have many books on both subjects. Looking very forward to reading other books from you!! !